A family tree worksheet can help you analyze your research, assist in keeping your notes organized, and provide a summary of your work. Genealogy research requires a lot of recordkeeping and note taking. Worksheets can be a real time saver and help you organize your research. There are many types of forms which can be considered family tree worksheets. Genealogists use a variety of charts and forms to record the information they have collected. Each has a specific function and use in the research process. Some forms focus on one individual. Others look at family units or catalog the type of proofs and sources that have been found. These charts trace the descendents of one individual or one couple. They record the names of children, grandchildren, and individuals from additional generations, along with the vital statistics for each person. A descendent chart can be used to track siblings, aunts, uncles, and cousins. A genealogist can use a descendent chart to analyze migration patterns and naming traditions. An ancestor chart is often called a pedigree chart. It focuses on the direct ancestors of an individual, specifically the parents, grandparents, and great grandparents. Siblings are not included in an ancestor chart. An ancestor chart comes in a variety of formats, such as a fan or a tree. 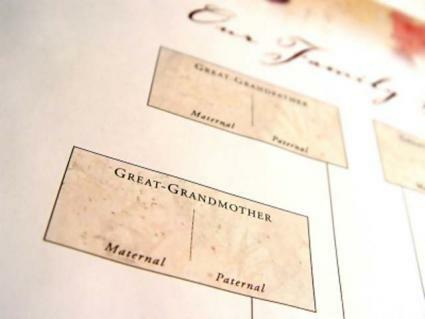 A genealogist often uses an ancestor chart as a guide through multiple generations. This type of worksheet helps organize long family trees. A family group record focuses on one family. It will contain information on one set of parents, and include a brief mention of their parents and extensive information on their children. Similar to a descendent chart, a family group record has more detailed information. Many times it will include burial information, military service, and church affiliation. This snapshot of a family helps a genealogist understand the dynamics of a particular family. It makes it easy to see if children were born in different states, if there is a long gap between children, or if multiple family members died around the same time, suggesting an accident or epidemic. This type of family tree worksheet has the most details about an individual. It creates a portrait of the person. Genealogists also analyze this form for possible new research leads or clues to new search avenues. This form creates a list of sources that have already been reviewed. It is very important for Internet research, as it keeps a genealogist from wasting time checking the same sources over and over. Cyndi's List of Genealogical Sites on the Internet has a list of free worksheets on multiple sites. FamilySearch has numerous forms for many uses. Ancestry.com has free charts for downloading. Family Tree Magazine has a variety of worksheets. You can use genealogy worksheets to summarize your information and further your research. They are also an effective organizational tool.